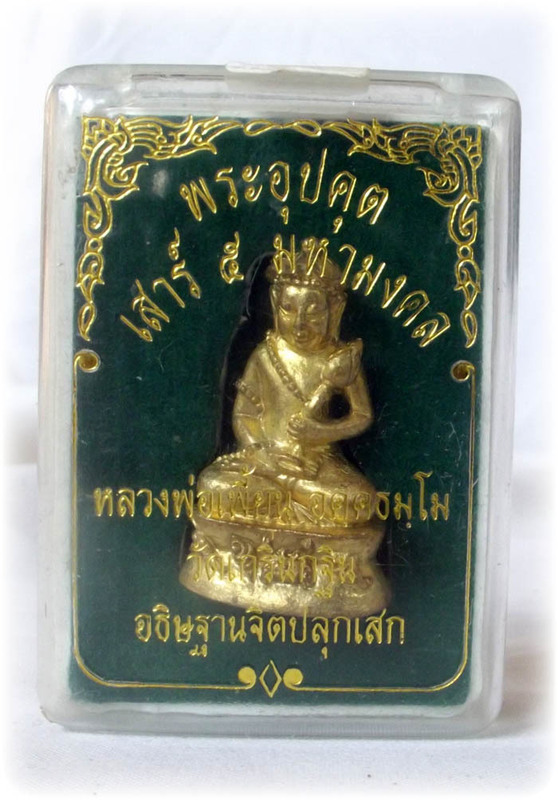 Pra Upakut/Pra Bua Khem Buddha image made from ‘nuea tong rakang’ (temple bell brass), filled with sacred powders and empowered by Luang Por Pian of Wat Grern Gathin in Lopburi. 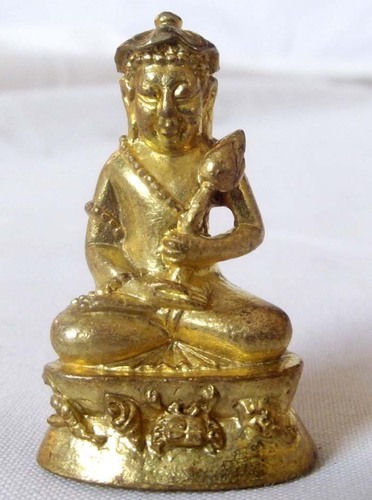 This loi ongk statuette was released in the Sao Ha Maha Mongkol 2553 BE edition of Wat Grern Gathin. This edition of amulets was blessed on an auspicious fifth day of the fifth lunar month, with a series of Pra Sethee Navagote amulets spearheading the edition. The Buddhist saint Pra Upakut is also known as Pra Bua Khem. This Buddhist amulet offers powerful protection against black magic, and acts as a defender against Mara demons. 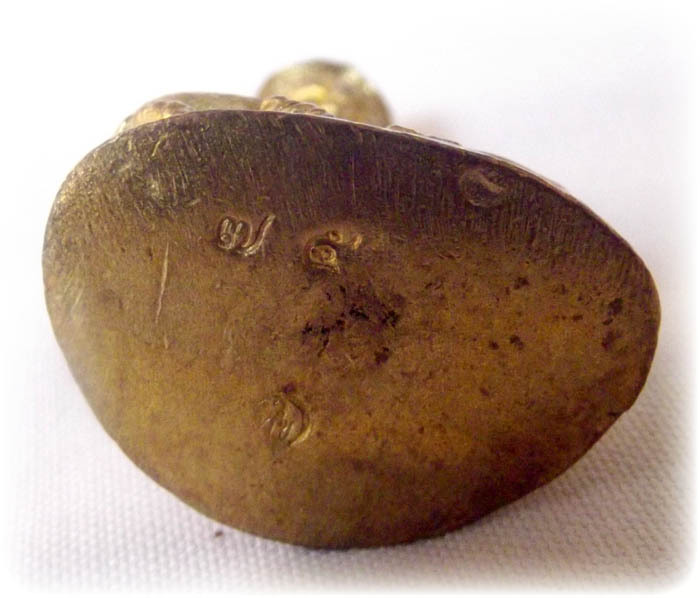 Pra Upakut’s supernatural powers can also be used to bring in wealth. 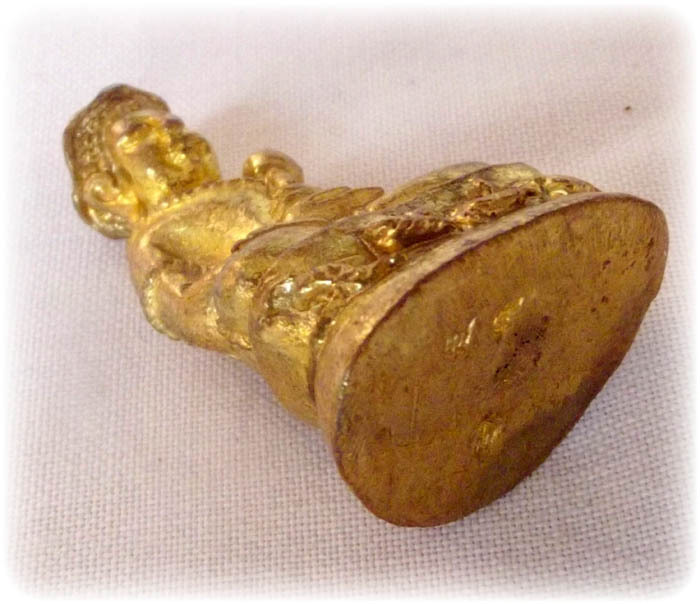 The series code number and edition authenticity stamp are embossed on the base of the loi ongk statuette. 2. In the place of business: increasing wealth. Mahaa Upakuto Mahaa Laapo Putto Laapang Sappe Chanaa Pahoo Chanaa Raachaa Buriso Itheeyomaa Namo Joeraa Metaa Jidtang Ehi Jidtang Jidtang Biyang Mama Satewagang Manussaanang Sappalaapang Pawandtume EhiJidti Jidtang Pantanang Upakudta Ja Mahaa tero Puttasaawaga Anupaawena Maara Wichaya Nirapaya Dtechabunyadta Ja Tewadtaanambi Manussaaanambi Ehi Jidtang Biyang Ma Ma Imangkaaya Pantanang Atithaami Ba Ayyisudtang Ubajsa-i. The amulet comes with the original box from the temple of Wat Grern Gathin.